The guided-missile destroyer USS Zumwalt (DDG 1000) arrives at its new homeport in San Diego on Dec. 8, 2016. US Navy photo. 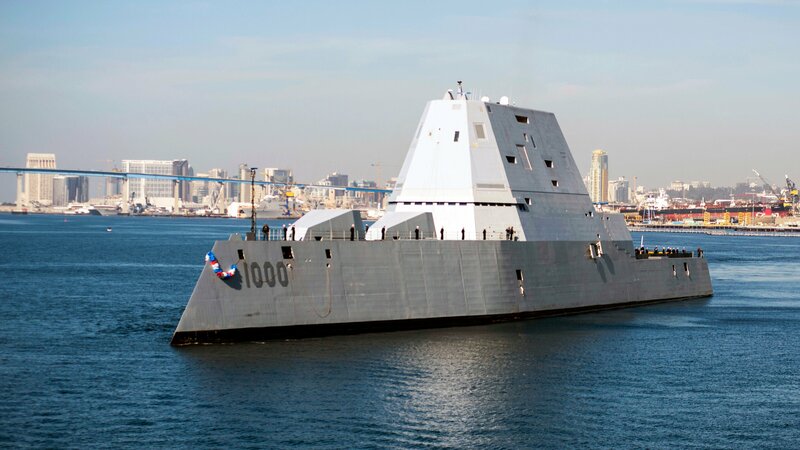 The Navy is revamping the Zumwalt-class destroyer’s requirements and will morph it into a focused surface strike platform, the director of surface warfare (OPNAV N96) told USNI News today. The ships were originally designed to support embarked forces ashore with long-range gunfire with GPS-guided shells fired at fixed targets. The new emphasis on surface strike would make the stealthy ship more effective against other surface ships in blue water as well as closer to shore. Service leadership is reviewing the recommendations of a Zumwalt Requirements Evaluation Team, which sought to bring together acquisition, requirements and operational experts to generate a cost-effective plan that generations the most warfighting utility for the three DDG-1000 ships – using the same rapid requirements-generation model the Navy used for the frigate program. Rear Adm. Ron Boxall told USNI News today at the American Society of Naval Engineers’ annual Combat Systems Symposium that the 60-day effort by the FFG Requirements Evaluation Team helped each stakeholder understand how their needs interacted with others’ to affect cost, schedule, operational effectiveness and more. “I was very pleased with where we came out because some of the decisions were much more about the concept of what we’re getting instead of the actual platform we’re getting,” Boxall told USNI News during a question and answer period after his remarks. “So now fast forward: we said, hey, it worked once, let’s try it again. Let’s get this same type of team together and take DDG-1000, which has some of the most advanced capabilities of any ship we’ve ever produced, and at the same time look at some of the challenges we’ve had. It’s no surprise, we have some very expensive bills still outstanding with the LRLAP (Long-Range Land-Attack Projectile), for example; we terminated LRLAP last program, and we said we’ve got to go look at where we want to go with that gun. So looking at where we go with that gun, how we can take advantage of what that ship is good at, and come up with a new set of requirements. Obviously, a lot of those are classified, but the good news is that we’re going to look at focusing that ship more on offensive surface strike. And so this ship was already designed to do some of that mission, but we were focused on the very clear requirement we wrote for this ship in 1995, and the world has changed quite a bit since then. And so we’re modifying the missions and where we are with it. 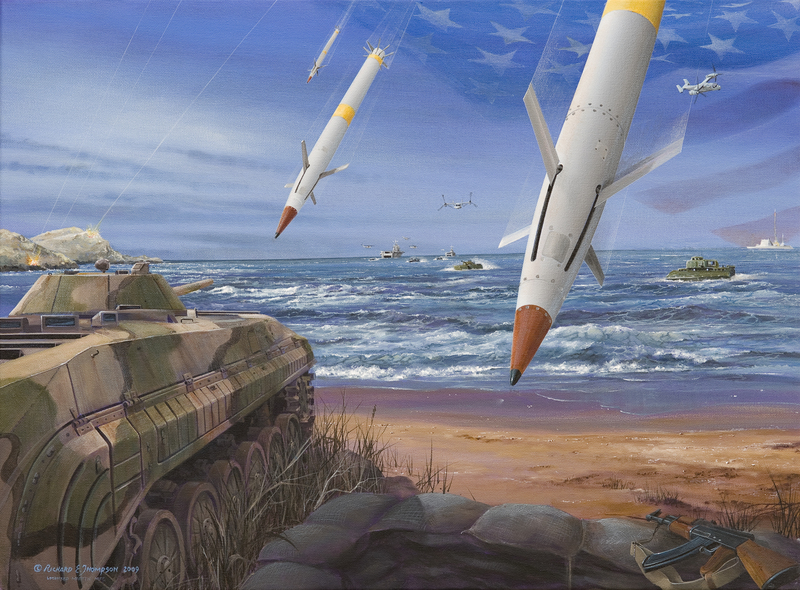 “You’ll hear more about this as we go forward with it, but the gist of it is, the big takeaway is, we see an opportunity with this ship, with its ability to carry the weapons it can carry and the types of design we put into it for signature control, that we think is a very good platform to be used forward as a surface strike platform,” he continued. Though the new mission focus is a major development for the DDG-1000 program – many have wondered what the three Zumwalt-class warships would do without the accompanying LRLAP – Boxall said the process the 60-day requirements evaluation teams have used is also very exciting for the requirements community. In some past cases, such as the CG(X) next-generation cruiser, requirements officers have spent years on a program, only to have it ultimately canceled. With this new process that brings together all stakeholders right at the start, along with computer tools that allow them to generate numerous iterations of a ship design, the Navy can work through a program’s requirements much faster and come up with a more mature and technologically informed set of requirements. “What’s exciting about this [is] we’re starting to create a repository of knowledge that we can use to reiterate as we need to go along,” he told USNI News after the event. Asked about applying this methodology to more programs, like the Future Surface Combatant family of systems that followed the canceled CG(X), Boxall said those discussions have already begun. “We actually took some of the work we’re doing with Future Surface Combatant and brought that back (to the FFG Requirements Evaluation Team); we said hey, the Future Surface Combatant is about where we’re going with the whole family of ships, so if we’re going to be producing an FFG of the future that’s going to be kind of at the small surface combatant size, then we don’t want that to be disconnected,” he said. And moving forward with the large, small and unmanned surface combatants the Navy is considering for the Future Surface Combatant family, Boxall said the designs that have already been iterated can be used as a good starting point for future efforts.